With the LESS app release imminent, I decided to venture into the core city of Los Angeles to meetup with a phone gap development group. They were presenting how to make mobile websites with Apache Cordova at a co-working place called OPODZ. Located off of 2nd St, finding where to park becomes difficult and settling for an overpriced parking garage may be necessary. If you drive too far away from the nearby shopping center, you will be positioned in a local homeless community where dozens of people live with all their possessions kept loosely within stolen shopping carts and tattered tents. Entering the well-lit and comfortable area inside eases the transition from the hopelessness of the outside to the creative one within. Programming here is relatively quiet. 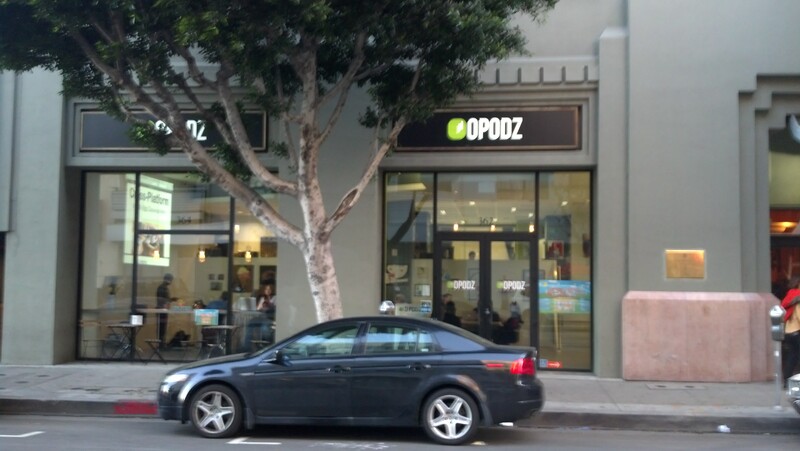 Highspeed WiFi, 24/7 access via key card, mailboxes & storage is all advertised as membership perks of OPODZ. The kitchen is fully stoked with coffee, tea, and alcohol. Computers are laid across the walls and desks of the upper floor. Ideas and thoughts are drawn in various colors on a black chalkboard. As groups correlate below, the people above work on their own projects. As a mathematician writes algorithms on a nearby whiteboard and others pear into their laptop screens, I glance down at the individuals learning below. Of the 21 devices, 12 were Apple and 9 were Windows. Each personal computer has a new project on it that no has yet seen. Only the future holds the secrets of what will come out of nights like this. Following the events helps to see the beginning stages of work and places like OPODZ tend breed polished products before they hit the market. Go there if you want to relax and work on something new.